Farm Chicks was absolute vintage madness, I tell you. So much to see! Every seller (ok, there was one exception*) created such inspirational displays and to me the entire show felt like it had a great balance of vintage, shabby, rusty, chippy, retro, mid century, architectural, repurposed, garden, home, collections, ephemera and industrial (although I wouldn't have minded a little more vintage Christmas). 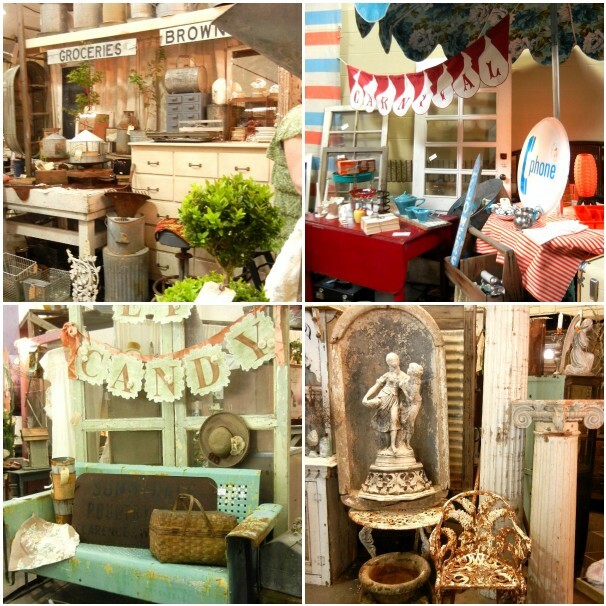 Along with all the great vintage treasures were The Crowds of Vintage-Loving People. I think every other photo I took had someone’s rear end in it. It was unavoidable. I tried. Then I just went with it. *the exception ... I don't mind a little digging! Just a few things from Mt. Vintage Linens. And a bit of vintage bling from Lisa’s booth. In addition to the show, there was breakfast at Chaps with Laurie/Ethel and her mom. Chaps is decorated like something out of a vintage dream! Already thinking about next year! I would love to see these artists and vintage sellers! I would've needed smelling salts with all the sensory overload......talk about inspiration! How fun it must have been to be with like-minded peeps! I bet you'll be working overtime in preparation for your show, with all the ideas you got! Looks like great fun to see it all and I think I would be so overwhelmed I wouldn't be able to make a decision until those panic buys at the end when I realize I'm about to leave empty handed. I'm glad you got some goodies! We don't have those here - well, 2xs a year we have a special wing at the flea market but it's not nearly enough - thanks for taking us along for your trip! What a bummer you got so many bum shots! (Please, I know I should be ashamed, but I just couldn't resist.) Will you show us your treasure close up? Pretty please? With a cherry on top? A vintage tablecloth cherry? Please? Maybe.....next year I can come too? Farm Chicks looks like absolute vintage madness and fun. 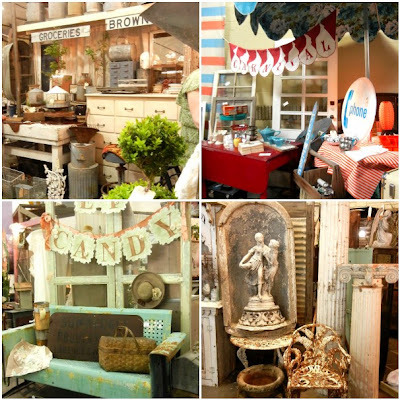 I see so much stuff that I would love to add to my vintage treasures here at home. Thanks for sharing all of these wonderful photos. The Dalai Lama says that instead of being jealous, we should be happy for the good fortunes of others, because then we have many more opportunities for happiness. So I am very, very, very happy for you and Laurie and everyone else who went to Farm Chicks, and I am not at all sad that it is so far away; nor am I jealous of all the fun you have. No, I am not. Not one bit. I am much too spiritually evolved for that. I'm in vintage envy!!!! So glad you got to go...looks like so much FUN!!! Thanks for sharing the pics so we get a sense of the excitement!!! Every year I tell myself that I'm going to make the grand journey from Mississippi to Farm Chicks, but then I forget about it until I read your account and Laurie's account. I saw your comment over on Pam's blog and had to check out the person with the incredibly beautiful vintage red brooch. I'm now a follower!!! A weekend of treasures was to be had!! Oh, so much fun!! How did you resist all the treasures? I bet you got ideas for your show this summer. I would simply go nuts there. hooray for an amy post. Such a cute and clever post! !=) made me want to have it start all over again!! What a great post and you really looked like you were having a BLAST all day! I love seeing our postcard for the Retreat Summer Vintage Market in your photo - hope you can come visit us on Camano Island, WA on June 25th! Oh My!! What a fun filled day! So happy to see you picked up one of our Mad Hatter Vintage Flea Market Posters! Would love for you to join us September 30 & October 1 at the Five Mile Prairie Grange in Spokane, WA. Before, during and after. With paint.